Create unique rhubarb stepping-stones with leaves to enhance the look of your garden. Everyone has these beautiful pieces in their gardens it seems. You can actually craft some yourself with a little know-how, good-sized rhubarb folliage and patience. What you will need to create these for your garden is some good uninterrupted time and a few materials. This includes pre-mixed concrete, plastic sheeting, and chicken wire. Have some decent sized rhubarb leaves this year? This is a must of course, depending on what size you would like your stones to be. Have a few at least on hand in case of damage. First, choose a level area to place your stepping-stones, and where they will not be disturbed while curing. Assemble your leaves and other materials as needed. Cut out a piece of plastic that is at least 6 inches larger than your leaf. Lay the plastic down and place the leaf on top in the centre. Make sure the vein side is facing up. Mix the concrete making it slightly stiff. 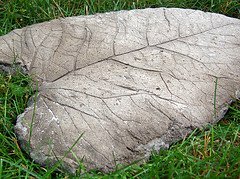 Cover the leaf with the cement with a small trowel or your hands being careful not to rip it. Protective gloves would be a good idea. Cut chicken wire to the same shape of your leaves. The wire should be one and one-half inches smaller than your leaf. Place the wire shape on top of the concrete. Make sure it doesn't go over the edges. Layer over top of the wire to the same thickness again with the concrete. While carefully spreading, remove any air bubbles. The plastic is now pulled up around the leaf and the edges are smoothed. Place dirt or mulch up against your stone for support. Cover with plastic. This second piece of plastic can be one huge piece to cover the whole thing at once. Let the concrete set for at least 2 days. Remove the plastic and turn your stone over. Spray the stone to remove any leaf pieces that may be stuck. DO NOT WALK ON THEM JUST YET...the concrete goes through a second stage of curing. For another week, spray daily and make sure they are set firmly into the area of your choice. Leaves from the rhubarb plant may not be edible, but you can certainly craft them into something lovely, unique and original to pretty up your garden space. Do you like to do crafts all year long? As long as you have your cement and other materials out think about making your own birdbath, or bird-feeder. Other materials are quite popular too for garden crafts like stones or planters.